The first time I read The Color of Water, I was deep in the woods of Otter Creek, a lovely wilderness in West Virginia. In my hammock strung between two trees, with the musical creek flowing just below our campsite, I began to read. From the first page I was fascinated by the story of James McBride and his mother, Ruth Jordan McBride. I didn’t climb out of the hammock until hours later, when I’d finished the book. That summer I was planning a seminar, “Questions of Identity,” for Case Western Reserve University and was looking for pertinent memoirs. I knew immediately that The Color of Water would make the reading list. In the past eight years I have introduced McBride and his mother to more than 135 students. The Color of Water tells the story of Ruth, born an Orthodox Jew, who leaves her family to marry an African American man and is, according to Orthodox Jewish tradition, then considered to be dead. When her husband dies she is pregnant with her eighth child (James). She then marries another African American man and has four more children before he dies. With very little money but an unusual amount of “chutzpah” (nerve), Ruth gets her children into the best schools and sees them all graduate from college. Then Ruth, her maternal job done, earns her own degree in social work. Although McBride writes that his mother had “little time for games, and even less time for identity crises,” my students – most of them in their first year of college – are at a perfect age for questioning who they are. Reading The Color of Water not only provides a forum to discuss race, religion and identity, but also models a way for them to tell their own stories and those of their family. While teaching at Ohio State University, McBride wrote a story he felt compelled to tell. I ask my students to write a story in a similar urgent vein about themselves or someone else in their family. One student wrote about a brother’s suicide attempt; for this paper he spoke to his brother for the first time about what had happened, a family secret that was never discussed. Another wrote about her father’s desertion of the family when he returned to Colombia. Other students took a lighter tack, describing humorous family stories. When I first present the assignment, some worry that their story won’t be significant, and certainly not as dramatic as that of McBride’s family. Once I assure them that any story they choose to tell will be significant, I am amazed at the papers they write. At the end of the semester, many of the students choose The Color of Water as their favorite book. Some years I change a few of the titles in the syllabus, but I have no plans to eliminate this memoir. In 2014 I began facilitating discussion groups for Books@Work, a program which brings professors and books into various workplaces. For one session I met with mentors and parents from the Intergenerational School. Without knowing much about the participants, I decided to use The Color of Water. In each of four sessions, we discussed a topic illuminated by the Jordan/McBride family, as well as our own. I began by asking each person to tell us where she came from, and I suggested that the group members could interpret that in any way. By the time we had gone around the room we knew that we were women of all ages, of various educations and several religions. And we discovered that we all had stories to share. The Color of Water is a marvelous text for young people and adults, an evocative opener of discussion. I never tire of teaching this book. Italo Calvino defines a classic as “a book that has never finished saying what it has to say.” On each reading – and there have been many – I find something new in The Color of Water. James McBride offers us lovely writing, as well as a memorable family story which I feel privileged to share with my students. Image: Vista of Peace, Ursula Mabin, Haifa Sculpture Garden, Haifa, Israel. Image by Guillaume Paumier, CC-BY, 2011. This piece, written by Gail Arnoff, was originally posted on the Ansifield-Wolf Book Awards Blog. An adjunct professor at John Carroll University and Presidential Fellow in the SAGES program at Case Western University, Gail has taught in many Books@Work programs, and we are grateful to her and to the Ansfield-Wolf Book Awards for allowing us to repost her writing here. 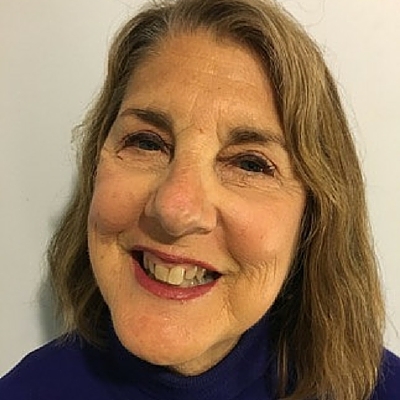 Gail Arnoff has been teaching since 1967 in a variety of settings: public schools, adolescent psychiatric units, and colleges. Currently she is an adjunct in the English Department at John Carroll University and a Presidential Fellow in the SAGES program at Case Western Reserve University.